Without any preconceptions I decided to attend the AFRI conference on social justice and human rights and found it very thought provoking and a really positive beginning to the weekend. I was surprised and delighted to be asked to sing at both the close of the first day and at the kindling of the flame in the market square, even though I was not scheduled in the programme. 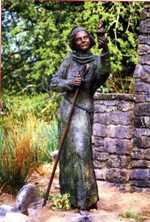 But the highlight for me was the St Brigid’s eve ceremony leading to the well. People gathered around the bonfire as a large St Brigid's cross was woven by the firelight at the Japanese gardens. The magic began as we all circled around the sacred flame chanting and singing. It was very special to see everyone coming together in peace, holding their lanterns and candle filled jars and to experience this ritual of light, sound and movement. Amazingly the night had become really calm, in stark contrast to the gale force wind that had blown behind torrents of rain all day long. It was as if St Brigid had spread her cloak out over us or as is sung in one of the chants, we were ‘faoi bhrat Bríde’. Walking slowly we approached the well close by, which was lit all around by candlelight. The pathway there was strewn with rushes and straw and the ground felt soft and comforting underfoot evoking some strange memory in the psyche. We then proceeded all the way to the main St Brigid’s well under the curious gaze of a rather bemused mare peering out from her stable in the national stud. I led the chanting and it was almost haunting to hear it echoed by over a hundred voices behind me. All along the road, torches were burning from flame topped posts impaled in the earth. 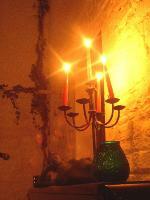 It felt truly primeval and wonderfully evocative while the atmosphere was very spiritual and loving. We sang all the while guided by the main bonfire in the distance, the heat from which seemed to reach out to welcome us. Its colours blazed in orange, red and yellow and the firefly sparks soared up into the night sky. Everyone threw some turf onto it as a symbolic gesture to celebrate the importance of the hearth in our lives. As we crossed over the bridge into St. Brigid’s holy ground I was totally unprepared for the stunning beauty of the scene before my eyes. It was glistening with so many candles, and brightly lit hand made paper lanterns were hanging from the branches of the trees blowing softly in the night air. For a few moments it took my breath away and I felt privileged just to be alive and present. We circled the prayer stones and the well twice singing softly all the time and then we gathered at the centre by the fire and continued with the ceremony. Miriam performed a wonderfully expressive dance with the Brat Bríde, holding it aloft and swirling it over everyone as a symbol of the shelter and protection of Brigid’s cloak. The sound of the water from the stream gurgled along and I felt so connected to all the natural elements and to everyone gathered there. I now began to appreciate all the planning and hard physical work that had gone into creating such an amazing spectacle and gave thanks for the gift of the Brigidine sisters, Mary, Phil, Pat and Rita and for their generosity of spirit. At the close of the ceremony I was asked to sing the Brigid’s Canticle and it was very easy to sing it from the heart. On St. Brigids Day, I was again asked to sing the Brigid’s Canticle beneath the inspiring and awesome arches in the historic Kildare Cathedral. This was a prelude to our walk in ‘the footsteps of Brigid' and our pilgrimage across the Curragh plains. I felt a real sense of continuity while discovering the ancient historic sites and learning about the legends and lore of this strong woman. We celebrated by circle dancing on the ancient Rath and prayed for peace at the ‘Peace Pole’ and sang songs around the fire amidst a grove of hawthorn trees. I now begin to understand the old Irish concept of ‘thin places’, they are places where the line between this world and the other world narrows to a thin veil. Here we were nourished spiritually with healing for the soul and bodily with piping hot soup and I sang the ‘Gabha Molta Bríde’ before we moved on. The celebrations ended later that evening in the Silken Thomas where everyone reflected on their experiences and spoke about the memories that were especially precious to them. 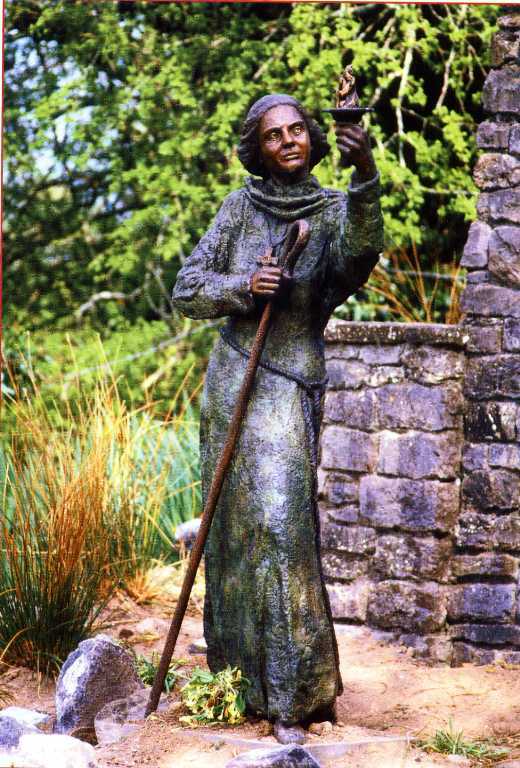 I learned about some of the old Irish traditions associated with St. Brigid, like stepping through Brigid’s girdle to make wishes for the year to come. We continued to celebrate with song and good craic throughout the evening. At the close of the festival Mary Minehan wove a fresh St. Brigid’s cross and as each rush was put in place a person offered their own particular thought to be woven into it. The wishes were imaginative, personal, sometimes poignant yet always thoughtful. The finished cross, which will be kept in Solas Bríde for the year, seemed such a powerful symbol and epitomised for me the spirit of the Féile Bríde, which is that everyone is valued and included. For me, Brigid is an inspiring and assertive voice. A woman with the courage to speak out passionately for what she believed in with power and gentleness.